No-knead, no-rise, no-yeast bread in 40 minutes start to finish? Yep, you’d better believe it. When I first saw this recipe here I couldn’t believe how easy it was. Bread is usually a long processes involving waiting around, for a couple of hours at a time, to give your yeast a chance to prove (any bread buffs out there – get the pun?!) that it is alive and kicking (what an attention seeking little so and so!). No-knead, no-rise, no-yeast means no waiting...at all. Whilst the bread is baking in the oven, you have just about enough time to wash up, call some friends round and crack open a bottle of wine. Once this bread is out of the oven, it requires immediate consumption. This is not a dramatic over exaggerated expression of how delicious this bread is. Rather, a slight drawback of taking a short cut in baking. If left to go cold it can be a little stodgy. Of course if you do bake it in advance, I would simply advise warming it up before you eat it. 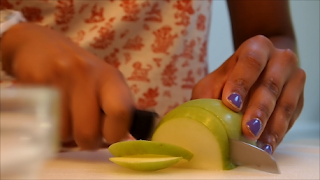 On the plus side, this recipe is all about getting creative. Use the basic recipe of said amount of flour, salt, water and olive oil and let your imagination/taste buds do the rest! I’ve tried paprika and chilli, olive and rosemary (as used in the original) and even date and walnut. The ones in this post were my favourite. Sweet apple, crunchy walnut and salty, creamy cheese. Mouth watering already? Mine too! I just love the mix of sweet and savoury. When I go to the cinema, it’s always half sweet and half salty popcorn for me. And as for honey and sesame seed, if you’ve ever tried Jewish breads you’ll know honey and sesame is a tried and tested combination. This bread couldn’t be any easier if it tried. Now there is no excuse for not baking your own! Start by measuring out the flour and pinch of salt. Add the oil, warm water and cheese. (The measurements are quite specific but honestly, if you pour in 1 whole tbsp of oil instead of 2/3 by mistake it’s not the end of the world. The same goes for the water and cheese.) Stir until the mixture comes together using a wooden spoon. As the dough forms it will start to come away from the sides of the bowl. At this point tip out onto a clean surface. Push the dough around and shape into a flattened circle. Pile the apple and walnuts into the middle of your circle and pull the dough over to cover. 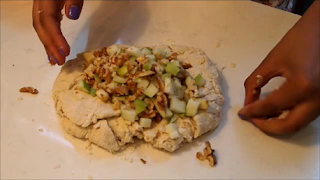 Use your hands to try and evenly distribute the apple and walnuts into your dough. 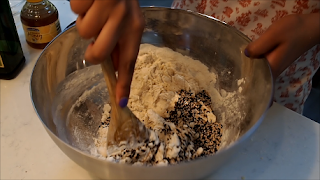 If it seems to stick to your hands, add a little more flour. 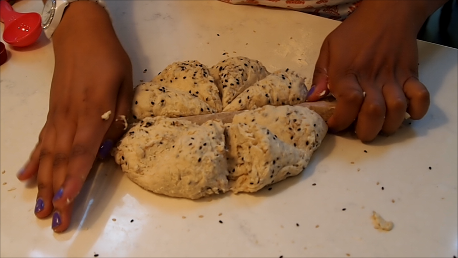 Shape into a round loaf, by tucking in the edges of your circle underneath (as seen in the video below). Use the handle of a wooden spoon to indent 8 segmentations in the loaf. This will make the loaf easier to cut/pull apart once bakes. Sprinkle some cheese on top for a cheesy crust. And now it’s ready to bake, for 30 minutes at 200 ºc. Start this is the same way as the other bread. Start by measuring out the flour and pinch of salt. Add the oil, warm water, honey and sesame seeds. (The measurements are quite specific but honestly, if you pour in 1 whole tbsp of oil instead of 2/3 by mistake it’s not the end of the world. The same goes for the water, honey and sesame seeds. If you only have one kind of sesame seed, that’s fine too.) Stir until the mixture comes together using a wooden spoon. As the dough forms it will start to come away from the sides of the bowl. At this point tip out onto a clean surface. . Push the dough around and shape into a round loaf. Use the handle of a wooden spoon to indent 8 segmentations in the loaf. This will make the loaf easier to cut/pull apart once bakes. And now it’s ready to bake, for 30 minutes at 200 ºc. I shared my breads with four of my friends at a “bring-a-dish” dinner party at mine, so I couldn’t blog about this recipe without mentioning them. I knew we are all foodies or at least dedicated food consumers (we all went travelling together and came back a lot heavier after two months in each others company!). But I did not realise how many great recipes they all have up their sleeves! Here is a little snippet of our feast, and my God it was a feast! These look so yummy, I love honey in bread. I'm definitely going to try this.